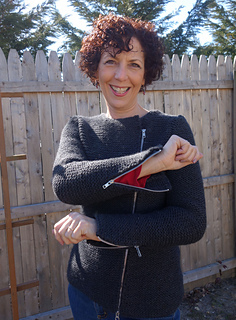 Elsie the moto sweater is so much fun – easy to make and a blast to wear! Her thick garter fabric is dense and weighty like her leather motorcycle counterpart. Zippers, positioned diagonally at the center front and at sleeve cuffs, add to the authenticity of this design – and a bit of sparkle. 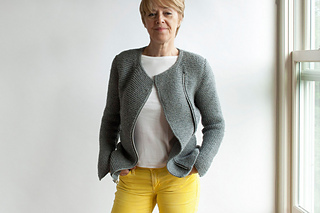 You’ll find this piece, worked flat from the bottom up in aran weight wool, to be a delightfully quick knit too. The overall garter stitch requires no blocking, enables virtually invisible shaping, and lends itself to easy seaming and zipper insertions by matching rows and following the paths of its large, defined stitches. Enjoy! Shown in Osprey wool by Quince & Co. (100% wool; 170 yds per 100g skein); color – Kumlien’s Gull #152; 7, 7, 8, 9, 10, 11, 12 skeins, or for comparable yarn, approximately 1050, 1190, 1340, 1480, 1630, 1805, 1950 yards. I always buy a little extra. 13 page pdf includes pattern instructions, photographs, schematics, assembly diagrams, photo tutorial for zipper installation, a row tracking grid for managing at-the-same-time instructions, and definitions for relevant abbreviations.